Olive V. Hamm, 88, formerly of South Wilson Street, Fredonia died Saturday, September 27, 2003 at Mequon Care Center, Mequon, WI where she had been a resident for the past few years. She was born on June 27, 1915 in Waubeka, Town of Fredonia, Wisconsin to Arthur and Viola (Turner) Mann. On November 19, 1938 she married George A. Hamm of the Town of Saukville at St. Rose of Lima Catholic Church in Fredonia. He preceded her in death on July 27, 1991. Over the years she had worked for the phone company as a telephone operator and the former Gilson Bros. Foundry in Fredonia, of which her husband was the plant superintendent for many years. She and her husband operated the former Hamm Sport Shop in Fredonia pursuing his great love of the outdoors, hunting and fishing. They were active in the village through the fire department and other civic activities. 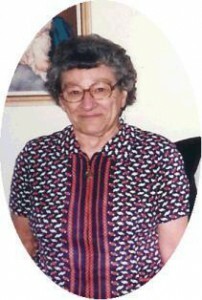 She was active in her church through the Christian Mothers, Holy Name Society and CYO. She is survived by her daughter Carole (Ken) Stettler of Whitefish Bay, six grandsons, Kevin (Kerstin), James (Kolleen), Eric, Tracy (Renee), Sean (Heather) and Christopher (friend Lizzie) Stettler, four great-grandchildren Kim, Mike, Danielle and Hannah Stettler, two brothers Wallace Mann of Tuscon, AZ and Ralph (Anne) Mann of Campbellsport, sister-in-law Sally (Nelson) Ver Plancke of Northbrook, IL and brother-in-law Joe (Betty) Hamm of the Town of Saukville, other relatives and friends. She is preceded in death by her husband, George and a sister Opal Noster. Funeral services Thursday Oct. 2 at 6:15PM from the Poole Funeral Home, Port Washington to Holy Rosary Parish-St. Rose Chapel, Fredonia for Mass at 7PM. Reverend Richard Fleischman will be the celebrant. Interment will be in the parish cemetery. Visitation after 4PM Thursday at the funeral home.